What Is the Average Golf Swing Speed? Until the addition of computerized technology and slow-motion cameras, it was nearly impossible to work out the exact speed of a golfer's swing. It was possible to estimate, based on the distance the ball traveled, but as measuring techniques improved, it was discovered that the average swing speed differed greatly from male to female and from amateur to professional. Swinging the golf club as fast as possible and achieving the maximum possible clubhead speed does not mean you will be a successful golfer. A golf swing should have a balance between power and control. There is no point in hitting a ball 300 yards right of your intended target. But since the introduction of biomechanical technology and analysis in golf, it is essential to know whether you have a fast swing or not because of the different shafts available to buy. A graphite club shaft suits players with a slow swing, while a steel shaft is designed for players and professionals who have fast swings. The relationship between the speed of your swing and the distance the golf ball travels is a complicated one. The distance does not correlate exactly to the speed at which you swing the club and the kinetic energy you impart on the ball. The important variables to remember are the loft of the club, the climate you're playing in, the type of ball you're using and the launch angle involved in the shot. However, the physics involved and the complex nature of biomechanical analysis can be distracting. There has been a simplified equation that defines only the speed of the swing and not the resulting impact on the distance and accuracy of the ball. The top PGA players have a swing speed average between 105 and 110 mph. Some of the fastest recorded swings have taken place at the various national and worldwide longest drive championships. The speed of these swings range from 145 to 155 mph. The leading LPGA players have been measured between 90 and 100 mph. 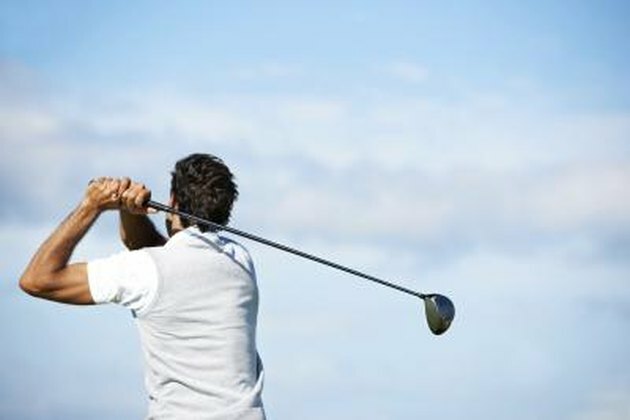 The average male golfer swings the club between 80 and 90 mph. The average female golfer swings between 60 and 70 mph. Most golf retailers have swing-speed radar that will attach to your driver and work out the speed of the shot. But these can be expensive. A more economical way of discovering your own swing speed would be to visit your local golf professional and inquire about getting clubs fitted to your specifications. One simplified equation would be to hit 20 balls, measure the distance the ball carries, remove the best and worst two shots from the total and then divide the average distance by three. A 1 mph swing-speed increase equates to a 3-yard improvement. Never try and measure your swing speed without a full warm-up. You will only be able to achieve your maximum result if your muscles are flexible and not stiff. Always take professional advice before buying new clubs, based on the speed of your swing.